Charles is a Nyikina man from Derby, the Kimberley, Western Australia. He has lived in Perth, Melbourne and Sydney. Charles graduated with a Master of Public Administration from Harvard in 2017. He completed a Bachelor of Science in 1997 at the University of Western Australia and has also completed the Australian Institute of Company Directors course and the Sydney Leadership Australia program. 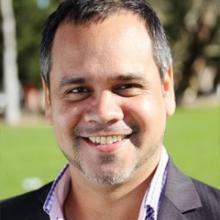 He is chairman of the Australian Indigenous Leadership Centre, was on the Board of the Benevolent Society and a Delegate for the National Congress of Australia’s First Peoples. Charles has 20 years of experience in Indigenous affairs across Australia including roles such as CEO at National Aboriginal Sporting Chance Academy, and CEO at Supply Nation and is currently a part of Lendlease’s Indigenous Supplier Diversity initiative. Charles was participant in the Aurora Indigenous Scholars International Study Tour in 2015.